SAN DIEGO, CA (January 30, 2017) – Resource Management Group (RMG), a San Diego-based materials management and recycling services provider, recently opened a new material recovery facility (MRF). Designed and installed by CP Group, the recycling system features MSS CIRRUS® optical sorting technology and is designed for both commercial and multi-family single stream processing. 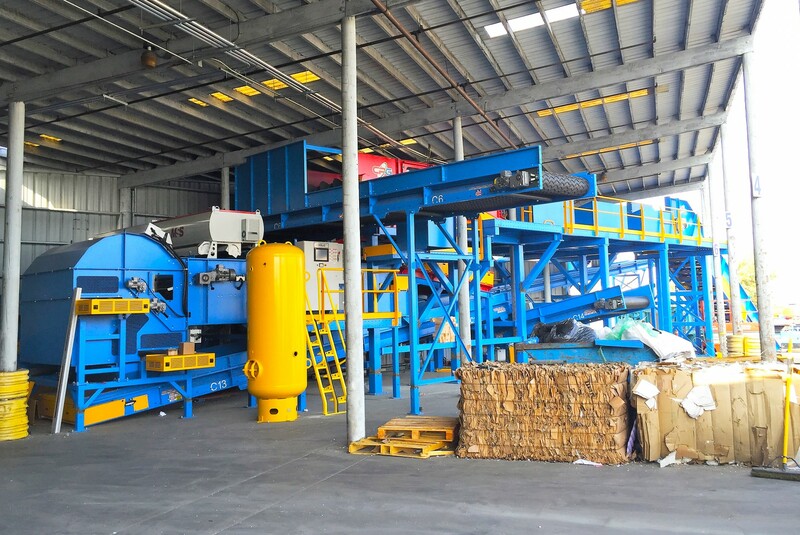 “At RMG, we are very proud to be the first MRF built in the City of San Diego in over 16 years. We look forward to playing a larger role as a solution provider in support of the City’s recycling ordinance and the state of California’s mandated diversion goals,” says Armen Derderian, President and Chief Executive Officer of RMG. The majority of the system input is a blend of commercial and multi-family single stream materials, including OCC, OMP, and plastic film. After loading onto the incline conveyor, the material goes through a manual pre-sort station where any over-size items are removed. The 3-deck CP OCC Screen recovers cardboard, and a CP Glass Breaker Fines Screen removes <2″ fines. The remaining material enters the MSS CIRRUS® optical sorter which is set up in a dual-eject configuration and positively ejects containers and fiber materials. This system is able to achieve a higher than 90% diversion with minimal manual sorting. The MSS CIRRUS® sensing technology features heavily in the success of the system. It allows the operator to select the different types of materials that should be targeted for ejection. In standard operation mode for this facility, the CIRRUS® positively identifies and extracts all containers (PET, HDPE, mixed plastics bottles, UBC and tin cans) into the first eject chute, and all mixed paper into the second eject chute, while allowing the residue to fall into the negative pass-through. Because a high percentage of the commercial and multi-family input stream consists of single sheets of paper as well as flexible packaging (plastic film), MSS’s proprietary air-assist system is installed to ensure proper material handling on the high-speed conveyor belt and through the detection and ejection zone. The Resource Management Group, Inc was founded in 1994, and is a full-service waste and recyclable commodities solution company headquartered in San Diego, California. Focusing on being an environmental conscious company, RMG provides turn-key, nationwide corporate recycling services.